Over the years my wife and I have enjoyed many spectacular meals at Eleven Madison Park, but this dinner was the finest of all. Quite simply, it was one of the most unforgettable, truly moving wine and food experiences of my life. We had the good fortune of sitting in the kitchen, which is much less glamorous than it might sound. 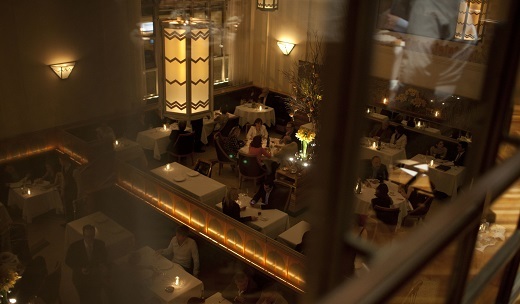 Eleven Madison Park doesn’t have a true ‘chef’s table.’ Those lucky enough to eat in the kitchen are seated at a small table tucked into the wall that is used by the staff during busier nights towards the end of the week. As someone who spent years working in restaurants, I have always loved the intensity of professional kitchens. There is something about the energy, adrenaline and sheer heat that is hard to capture with words. Guests are literally in the midst of the action as every incoming order is called out by the expediter, cooked and ultimately carried into the dining room. Needless to say, these are fabulous courtside seats. Executive Chef Daniel Humm and his team did a brilliant job with this tasting menu, which was full of highlights. I would be challenged to find a dish or two that did not dazzle. The first courses were all sublime. The raw fluke and scallop was breathtakingly pure and pristine. The goat cheese lollipop was whimsical and fun, but also seriously delicious. I loved the smoke sturgeon and caviar, which was served inside a perfectly cooked potato. The humble potato is so easy to overlook, but not in this kitchen. The lobster navarin was another breathtaking dish layered with beautifully articulated flavors. Humm beamed as he presented a whole roasted duck. So would I if I could cook like that. The duck, with its honey and Schezuan peppercorns, was another dish laced with sublime intensity. The beef was perhaps slightly more conventional, but it was cooked a perfect medium-rare and literally buried with black truffles. What’s not to love? John Ragan, Eleven Madison’s Wine Director, chose all of the wines. Frankly, it was nice to have a night off from thinking about wine too deeply. Billecart-Salmon’s 1998 Cuvée Nicolas François Billecart showed the house’s trademark cut and focus, which worked well to complement the early courses. I am a big fan of Albert Boxler’s wines. The 2004 Riesling Grand Cru Sommerberg was fabulous, as it presented a never-ending mélange of aromas and flavors to match its exotic personality. The 2004 Chassagne-Montrachet Les Blanchots Dessus from Domaine Darviot-Perrin was surprisingly fat and smoky, with luscious layers of fruit and a big, enveloping finish. Over time the wine found its center and focus. I thought it worked best with the lobster navarin. Geantet-Pansiot’s 1996 Gevrey-Chambertin 1er Cru Le Poissenot was much further along than I would have expected. It paired beautifully with the duck both in terms of its flavors and texture. Exotic notes of orange peel, star anise and spices played off the sweetness and Schezuan pepper in the duck beautifully. It was a wonderful pairing. That said, I can’t imagine the Poissenot has too many more equally brilliant days ahead of it. I was totally floored by Domaine de Trévallon’s 1990 Coteaux d'Aix-en-Provence Les Baux. It was fabulous with the beef, but the truth is it would have been great with anything, or nothing at all. Sweet layers of fruit, subtle herbs, cedar, tobacco and spices were all present in the glass, but the wine was really more about textural silkiness and elegance, both of which it showed in spades. Readers lucky enough to still be cellaring bottles can look forward to as much as another decade of fine drinking. What a wine! Humm’s Old Fashioned cocktail with rye, bitters and orange was a delicious pre-dessert that freshened the palate nicely, before we finished with a tasty bite of chocolate ganache. The Cognac Grande Champagne ‘Devant la Porte’ from Paul & Marie Fils from micro-négociant Nicolas Palazzi was a fitting end to a truly spectacular dinner. This single-barrel Cognac, distilled in 1951(! ), was immensely gifted with explosive fruit and layer after layer of flavor. It was simply monumental. I only hope to have an opportunity to taste it again. This amazing dinner at Eleven Madison Park was superb from start to finish. While not an inexpensive experience, it was worth every penny.